Danish vocal‑effects experts TC Helicon combine their established harmony and effects processing with some seriously impressive looping technology. 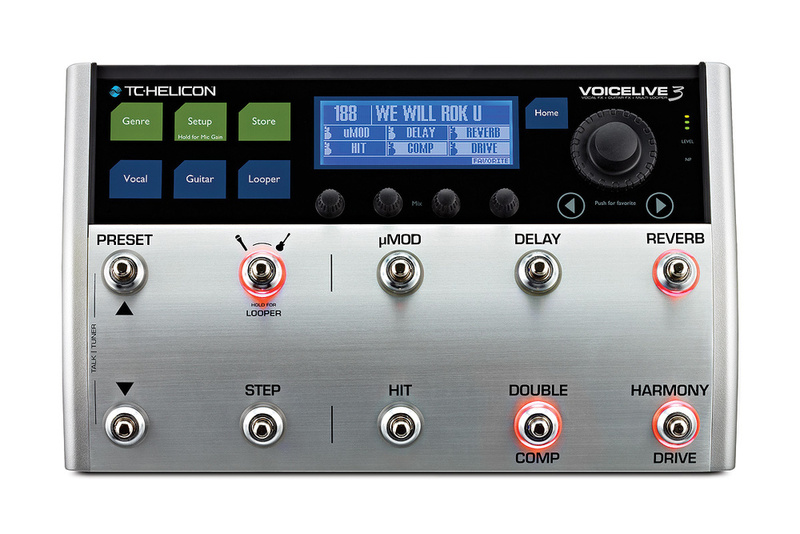 The new TC Helicon VoiceLive 3 is an all‑in‑one vocal and guitar effects unit that offers both state‑of‑the‑art and vintage vocal effects, along with the ability to generate harmonies and control them using a guitar or keyboard. Like its predecessor, the VoiceLive 2, this version is designed with an emphasis on real‑time harmony generation for a solo voice. Whatever your opinion on generated harmonies, if used well they can be the spice that elevates a sound from good to great. So what's new in VoiceLive 3? Offers of more presets, a vocoder and new harmony modes are intriguing, but may or may not be enough to make you insist on the newest model. But what if we told you that, along with improvements in harmony-generation technology, the TC Helicon VoiceLive 3 now offers some of the best thought‑out looping technology on offer for vocalists? First, a confession: I am one of those people who uses one unit for one thing. Now and again, though, that way of thinking means I miss out on some great gear. As someone who operates most comfortably under the KISS (keep it simple, stupid) framework, I admit to being a little trepidacious when trying out all‑in‑one units. When it comes to effects, there are a lot of processors out there that promise to be all things to all people. Most of them have strengths, but many have weaknesses, and that can mean that the complication of a multi-functional device does not seem worth the time investment. 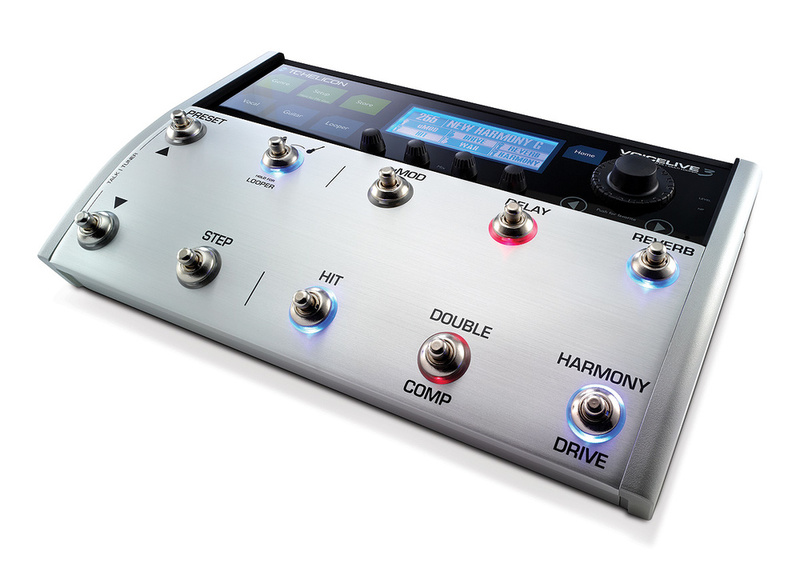 Confession two is that I am someone who prefers organic harmonies, but the VoiceLive 3 has not ignored me: the TC Helicon team have built in one of the most practical and easy to operate loopers I have used. So whether you prefer to sing in your own vocal harmonies live on the fly, or use the effects on offer to generate loops with automatically generated harmonies, the VoiceLive 3 has something to offer for anyone who uses their voice as an instrument. Hooking up the VoiceLive 3 is fairly easy, and the setup documentation is clear and easy to follow. Anyone hoping to start using the VoiceLive 3 immediately following setup, however, is in for a surprise. High levels of functionality, like those on offer in the VoiceLive 3, come at a price. That price is the learning curve. As the manufacturers themselves point out, you will need to head to their web site and read the full manual (available as a free PDF download) to be able to use the unit to its full capacity. The VoiceLive 3 is almost an instrument in its own right, and like any instrument, it requires a time investment. That doesn't mean there isn't a clever simplicity to how it is designed. 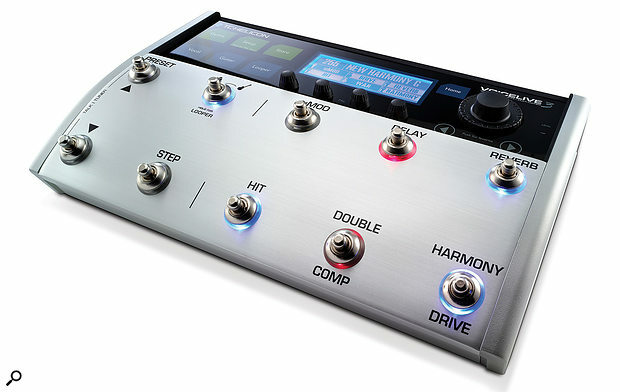 The VoiceLive 3 operates in three 'layers' and each one is accessed via the footswitch labelled Looper, which has a guitar and mic icon above it. Tapping it will swap between the vocal and guitar layers, whereas holding it down takes you to the looper layer. Before delving further into these powerful and complex layers, let's look at what is available via the other footswitches. 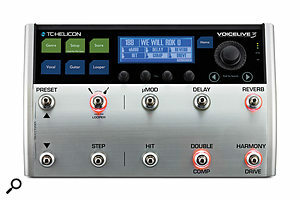 Given that there are over 250 effects on the VoiceLive 3, and that each effect can be adjusted to taste, TC Helicon have done a good job of deciding how these should be arranged. The footswitches allow you to make broad‑stroke changes, so Reverb, Delay, Harmony/Drive, Double/Compression and Modulation each have dedicated footswitches on the main board. When you select a preset effect, these footswitches will light up if the effect associated with them is part of the mix. For example, preset 148, 'Oct Dn GRP', has an octave-down harmony, delay and reverb as part of the mix, so the footswitches for Harmony, Reverb and Delay are all lit. You can tap on each individually to turn it off, if you desire. Scrolling through the presets themselves is done with the footswitches on the far left. The finer changes to preset sounds are done via the touchscreen and LCD interface, where you can alter the deeper details of the presets, including the actual mix/balance of the various components of which the preset consists. More on that when we delve further into layers, but the capacity for adjusting so many aspects of the presets (and then saving them) is a powerful feature. Curious to see what all the presets sounded like, I started by plugging in a mic and headphones, then tapping the Looper footswitch to get to the vocal layer. TC Helicon score points here for being practical in a live setting: the footswitch goes blue for the vocal layer, red for the guitar layer and pink for the looper layer. Such basic considerations are vital on stage, where lighting can be poor. Using the two Preset footswitches (the far‑left pair) you can scroll through hundreds of presets, turning off or on the various components of reverb, delay and so on via the other footswitches as you go. If you think trying out over 250 presets via footswitches sounds time-consuming, you're right. Press the Genre tab, on the top left of the touch‑display area. TC Helicon have grouped their presets into libraries; tapping Genre brings up a menu on the LCD, and turning the far‑right dial allows you to scroll through them. Whilst I'm no fan of forcing the cookie cutter that is 'genre' onto the amorphous dough of all that is music — especially on devices with such a capacity to inspire creativity — this feature is actually well thought through and not just about musical genres. There are groupings for presets pertaining to harmony generation, a group for amp sounds, groups for simple vocal enhancements and many more. These are very useful if you have a particular effect in mind, or if you're trying to emulate existing sounds. You also have the option of scrolling through everything on offer and seeing what inspires you. With over 250 presets, the VoiceLive 3 has everything from the wonderful to the weird. What sets the VoiceLive 3 apart from its competitors, however, is its much-celebrated harmony‑generating algorithms, so I want to take a look at those specifically. Earlier on I mentioned my preference for organically generated harmonies. My reasoning is partially that they just sound more 'human', but also because with 'human' voices, you are more likely to have 'outside-the-box' ideas. Humans can (and will) throw in notes that are deliberately dissonant, then resolve them, and this effect is great for adding tension, but is something that the usual offerings in harmony-generating devices don't make possible — at least, not until now. Dealing with the 'sounding human' issue first, the Humanize algorithms on the TC Helicon VoiceLive 3 are actually very good. They are also fully adjustable, so for those occasions when you do want something more synthetic sounding, you can indulge to your heart's content. All the inputs and outputs are presented on the rear panel.For those who like the sound of their own voice, as it were, all of the harmony presets allow you to adjust the Humanize level. Turning it to maximum will make the harmonies sound very much like your own voice is singing those harmonies along with you. Adjusting the level of the harmonies relative to the main vocal can help further if you still aren't happy with the results, but I really do think the VoiceLive 3 does a good job of sounding natural and full. Issues will occur with tracking if you play the wrong chord on your guitar, as many of the presets default to Natural Play mode in terms of harmony generation (that is, they will follow your instrument to generate harmonies), but that is to be expected. You'd throw off a vocalist in a live situation too if you played the wrong chords, although the resulting sounds would be quite different and may contain expletives. Of more concern is that the harmonies can waver oddly if you don't sing right up into the mic, or if background noise comes into the mic channel. If you have other instrumentalists performing behind you, this could lead to issues when playing live. If you are a soloist, adjusting mic technique may get around this but, at the time of writing, I have not had the opportunity to try it out on stage. Adjustment of the Humanize level is done in the vocal layer via the touch display, where you find all the fine‑tuning aspects that make the VoiceLive 3 so powerful. Tapping the Vocal button on the touch area brings up the screen for all the 'fine‑tunable' elements of the preset you are using. There are several tabs containing adjustable parameters, and the dial and arrows on the right of the display area allow you to navigate. The Harmony tab is the one you press in order to access the Humanize level settings, as well as the parameters that will get you around the 'thinking outside the box' issue I mentioned earlier (in which singers throw in deliberately dissonant notes), as it allows you to experiment with more interesting harmonies. Setting up how the harmonies are generated is done by selecting one of the modes. The Natural Play mode I mentioned earlier is the mode that many of the harmony-generating presets on the VoiceLive 3 will default to. It uses the signal from the instrument channel (along with the signal from your voice) to set the notes for harmonies. Natural Play mode does actually sound fantastic for songs that use classic three‑part harmonies in simple rock, blues and country arrangements. It may be a cheesy example 20 years on, but singing almost any of the songs from Trio (Dolly Parton, Linda Ronstadt and Emmylou Harris) through the VoiceLive 3 will sound very much like the harmonies used on the album. Whether you like country music or not, that album has some of the most stunning three-part harmonies you will hear, and they are ones the VoiceLive 3 reproduces well. Check out http://sosm.ag/voicelive-3-audio-1 to hear Natural Play mode in action. Of course, not all of us like sticking to simple arrangements and chord structures, and the VoiceLive 3 designers know this. In the Harmony tab, scrolling downwards takes you to the modes for each voice in the harmony set. There, you have the option to set one (or more) of the harmony voices to either Natural Play mode, to follow a set scale, to play root notes, or to remain fixed. This gives you a lot more scope for creating those interesting harmonies that play with strains and/or drones. Again, the only caveat is the wavering that occurs if you sing off mic, or if background sounds enter the mic channel. Looping has long been a hit with organic vocal enthusiasts as a way of creating harmonies. Obviously, you may already be content with the options available via the presets, but the looper adds another string to your bow here. In fact, it offers several. When a preset is selected, all of the footswitches that correspond to the active effects in that preset light up.Using the looper is surprisingly simple. Many loop stations on offer present you with complicated interfaces, but the VoiceLive 3's looper is fairly intuitive and doesn't take long at all to get your head around. On the VoiceLive 3, holding down the Looper footswitch gets you to the looper layer, and the LCD screen lets you know what all the other footswitches do in that mode. Be aware that whatever preset you have been using in the vocal layer will be the one defaulted to when you enter the looper layer, but you can still use the footswitches to move to another preset. Stepping once on the Hit button will start a click (which you can turn on or off), or you can tap it to get the tempo you desire. You start recording your first loop by tapping the Harmony/Drive button, and you tap it again to stop it when you are done. A nice feature is that if your timing is slightly shonky, the VoiceLive 3 unit will round to the nearest beat. Once your loop is recorded, you have several options. You can overdub more sounds onto the existing loop, or record a second loop on a separate channel by hitting the Reverb button to start and hitting it again to stop. One of the features I find fantastic on the VoiceLive 3 is that, when recording a second loop onto the second channel, you can make the second loop longer, but with both loops still playing in sync. This is a real advantage if your first loop is a simple one‑bar cycle, and your second loop is a pattern that takes up four bars. The initial one‑bar loop will simply be played under all four bars of the second loop. You can also start and stop these two loops independently of one another, allowing for more variation in terms of song structure than what a lot of other loopers offer. Changing your vocal or guitar sound whilst the loops are running is also no problem. You can do so by tapping through presets, or by going back out into the vocal layer for more control over the fine detail. You can then record or overdub more loops with the new effects settings. As someone who uses loopers as a key element in live performance, I would normally go for the option of singing in harmonies myself, one by one, in overdub mode. That's all well and good for us 'organic enthusiasts', but now and again it gets tedious for the audience. If, like me, a lot of your songs have low root‑note drones, for example, you'll know they are hard to sing in terms of breath control, and not that interesting to watch if you do it all the time. Of course, I add more interesting harmonies on top, but all that means is that the audience have to sit through two iterations of harmony, if not more, to get to the start of the main vocal. Cutting to the actual main vocal melody sooner can be a big advantage if you're trying to engage an audience. One of my own personal favourite presets is a fairly simple one: 'Fixed Harm 24' (preset 16). This generates a low, unchanging harmony note so you can sing your lilting main melody simultaneously with your low drone, because the low drone is generated by the VoiceLive 3. As mentioned before, it is convincingly human and proof that simple can be effective. If you use low drones along with your other harmonies, you can sing your first melodic harmony in at the same time as your root‑note drone, cutting down on loop setup time with your audience. Go to http://sosm.ag/voicelive-3-audio-2 to hear the 'Fixed Harm 24' preset at work. Another preset of interest to vocal-loop enthusiasts will be 'Chop Saw 16th' (preset 19). This effect causes whatever you sing to pulse in 16ths, and if you are in loop mode, this will be sync'ed exactly to the beat. This adds a percussive element to any song built out of vocal loops alone, without you having to resort to singing "uh uh uh” in 'O Superman' style (very hard to do consistently and in tune when live). The presets that allow you to sing like a Pink Floyd keyboard part, or shape your guitar sound with your voice (vocoder), are also useful for adding textures that can be pulled in and out at choruses. Note too that you can adjust the panning of each harmony voice, allowing for greater separation of sounds once more is going on in the mix. This can be the difference between flooding your listeners with over-complicated layers, and letting each part sit comfortably in its own space. Covering all the features on offer in the VoiceLive 3 is actually beyond the scope of this article. Suffice to say, the VoiceLive 3 is full of clever add-ons that have clearly been designed by engineers who know what it's like to play live. One feature I will mention, though, is mic-level control, as this is a big concern when using looping. When looping, anything coming through the mic channel is recorded, including peaks and the resultant distortion, so level control is a handy addition. TC Helicon have built in a way to set the gain on the mic input to ensure it doesn't clip, eliminating the possibility of having laid in all those loops then ruining it by clipping on the last iteration of harmonies/effects. If there is one thing I would like to see on the VoiceLive 3, it would be a bypass footswitch that cuts all effects on the layer you are in. Primarily, one that cuts vocal effects in the vocal layer, as there are always situations in a live scenario where you want nothing more on your voice than a simple reverb that you leave in the hands of your sound technician. He/she is, after all, the one that can hear the front-of-house sound. That said, those of you who end up using the VoiceLive 3 may use the two‑mic system, where everything performed clean is done through a separate mic, and this is the method I use. It does require soundchecking and balancing two mics, however, so bypass would have been a nice option. It is worth noting that most of the loopers on the market offering multiple sync'ed loops are only available with instrument inputs, so when you consider that, along with the many other well-executed features, the VoiceLive 3 looper is close to revolutionary for people who work primarily with their voice. No single unit combines the roles of guitar multi-effects pedal, looper and vocal-harmony generator as comprehensively as the VoiceLive 3, although the Boss RC300, with its mic input and three independent loop tracks comes close (albeit with fewer vocal effects). The combination of a Digitech JamMan Stereo and JamMan Delay would also be a competitor. You can watch a video demonstration of the VoiceLive 3 on the Sound On Sound YouTube channel, at http://sosm.ag/voicelive3‑video. Jordan Reyne is a full‑time musician with eight album releases and three Tui Award Nominations to her credit. Jordan uses loop machines as a key part of her performances. Check out her YouTube channel for more on live looping at www.youtube.com/jordanreyne, and her web site, www.jordanreyne.com, to listen to her music. Very good Humanize algorithms allowing for very realistic‑sounding harmonies. Extremely versatile thanks to the ability to alter presets. Well thought‑out design in terms of having access to broad and fine changes to the sounds. Use in a live situation has been taken into account very well. You need to be very close to the mic when using the harmony presets. Steep learning curve (though you wouldn't get this sort of functionality without one, and clear interface design makes it easy once you've read the manual). This is easy to use, on a par with the top loopers currently on the market, and designed with vocal looping in mind.